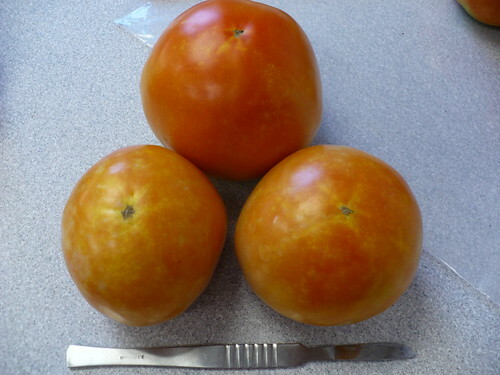 Summer and tomatoes, what could be better! Give this salad a try, I love making it with some multigrain bread from the day old bread rack. The fresh sweet tomatoes and hearty crunch will make your mouth sing! 2. 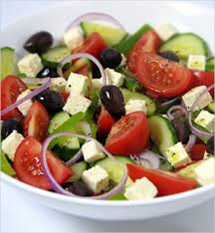 In a large serving bowl, combine tomatoes, sweet peppers, onion, cheese and olives. 3. 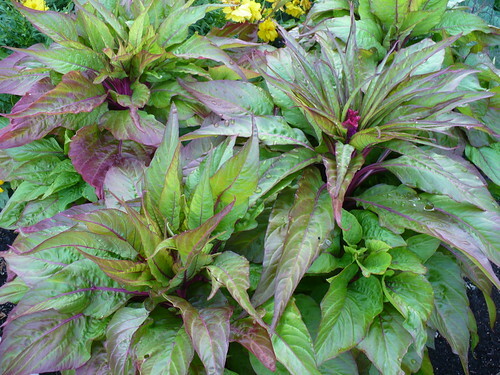 Wash, dry, and cut basil leaves into strips. Add to mixture. 4. Sprinkle vinegar and black pepper over salad. Mix well. 6. Meanwhile, preheat oven to 300˚F. 7. Place cubed bread on baking sheet and bake for 8-10 minutes, until slightly crisp, stirring occasionally. Shut off oven. 8. Just before serving, toss bread cubes with salad mixture. 9. Cover and refrigerate leftovers within 2 hours. Okra is one of those vegetables that I’m much less familiar with, and it also fits my category of “if you have to bread it and fry it to make it edible, it either isn’t edible or isn’t a vegetable.” That said, one of the biggest mistakes that people make with okra is harvesting it. I don’t know how many times I’ve seen grossly over-sized okra entered in a county fair. 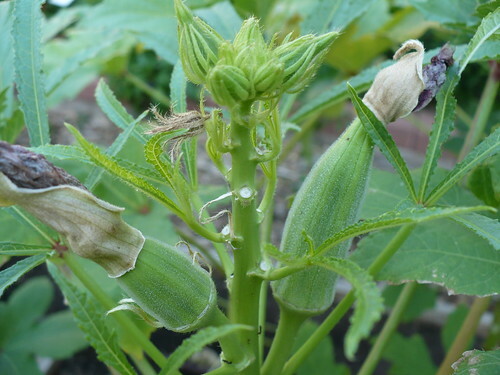 Okra goes from budded to over-mature in seemingly the blink of an eye. Here you can see the cluster of buds at the top and a couple flowers that are opening. 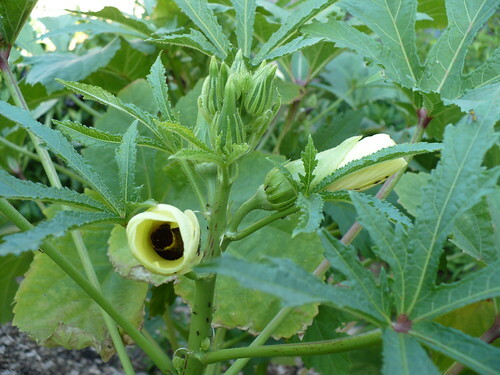 Here’s the okra a couple days after flowering. Actually, I would consider the okra on the right to be just about the right size. If you gently squeeze it, it is still tender and not too woody. 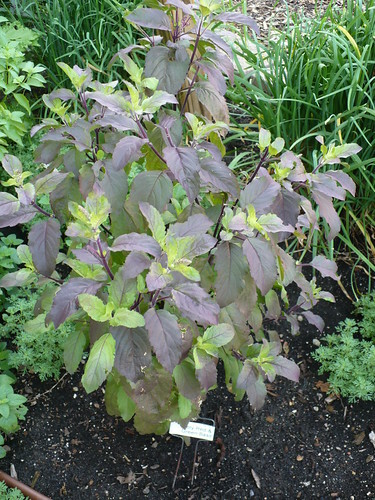 Woody okra – yuck! 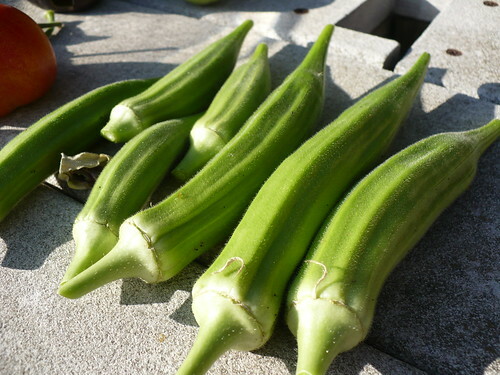 If you don’t harvest your okra regularly (every day or every other day), this is what you are going to end up with – huge okra that is extremely woody and not very tasty. The more medium sized pods on the left are probably still good for things like gumbo, although they are best slightly smaller. Another thing to be wary of when harvesting okra is that a lot of people are very sensitive to the hairs on the leaves and stems of okra plants. 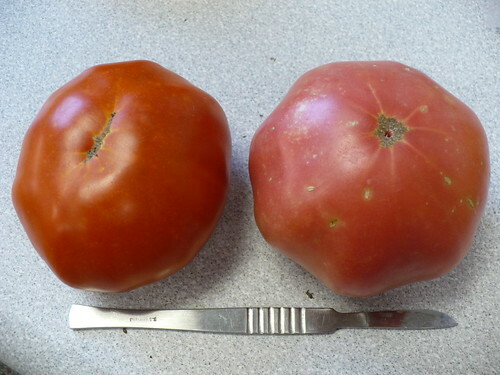 If you don’t want to get VERY itchy when you harvest, you may want to wear some combination of long sleeves, gloves, and use a pair of pruners or scissors! 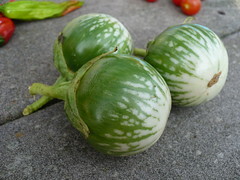 We harvested some new things in the garden today, most notably some Chinese Long Beans (including some that were already too big) and some Thai Eggplant, ‘Kermit’, that is round with green and white stripes. In the Family of 4 Garden, we harvested our first bell pepper, a couple chile peppers, a couple more jalapenos, and our first ‘Yummy’ snack peppers. 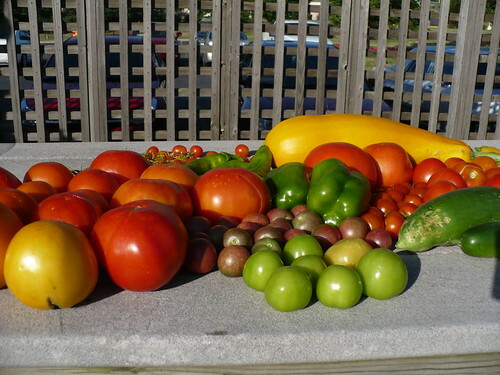 We also had a few more of the ‘4th of July’ tomatoes to harvest and another bunch of Swiss Chard. In reality, I should put the price of squash blossoms at “priceless” since I haven’t seen anywhere to buy them around Wichita, not even at the Farmers’ Markets. I think 50 cents might be a little bit undervalued, but I don’t want to skew the numbers too much. 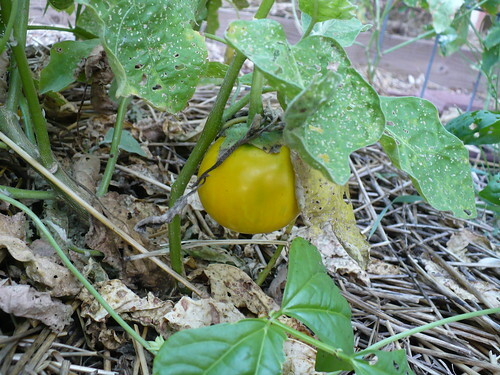 Of course, eating things that you can’t get from the grocery store is one of the intangibles of having your own garden!